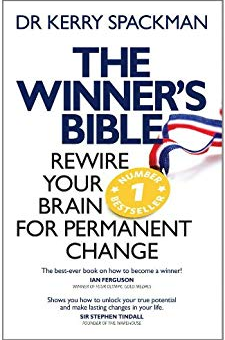 The Winner's Bible shows you how to permanently rewire your brain and transform your life using the same groundbreaking tools neuroscientist Dr Kerry Spackman customized for elite athletes, Olympic champions and businesspeople. When he was asked by a top Formula 1 team to help a champion driver who was struggling, despite having been treated by some of the best Sports Psychologists, Psychotherapists and Counsellors available, Dr Spackman quickly realised a new approach was needed. this approach was so successful, he was soon swamped by demand. the only solution was to write his tools and techniques down in a single, easy to read book so that everyone could have access to the same tools the World Champions had. the Winner's Bible is a riveting read filled with real life examples you'll never forget. Dr Spackman shows you how to "Rewire your Brain for Permanent Change". He explains why most self-help books don't work and why his program does. the proof of his tools is demonstrated in the lives of the people he's changed. A fully revised and updated edition.